You must be a member of the Paris Brunch & Picnic Group to attend this activity. Would you like to join this group? Would you like a cool fun mini-price for a party between expats? Here you are the good deal: free meal and drink at cheap price! In a hurry to find out more? Patience, put yourself first in the mood ... a small cobblestone street in Paris, old lampposts, in a small restaurant that smells good mood and friendly atmosphere. It will be past 9pm and you will order another drink. You will be already amazed by the price of it well below most bars in the capital. But when with your glass they will bring you a plate of couscous well stocked, there you will believe was a mistake. 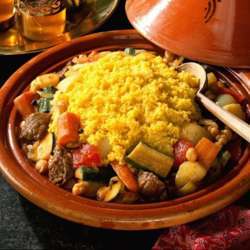 You will call the waiter, very nice as are all his colleagues, who will say to you "No, no mistake it's this Friday with a drink, we will offer you the plate of couscous". A concentrate of generosity in a system where everything is minted. Of course, this is not gourmet cuisine but it is still very good and the plate properly provided. In addition, the terrace is open until 11pm. Of course, the address is good, so expect to wait a little before going home. - Mandatory arrival on time ! - CONFIRMATION IS BY DEPOSIT ONLY. - Cancel if you can't make it any more ! !